The DIA Group is focused on raising awareness in our environment and throughout the year to ensure that people with disabilities live and work in a more inclusive society, in which everyone can enjoy equal opportunities. In total, among DIA’s workforce at the end of 2017, there were 542 people with some type of physical or intellectual disability, DIA Brazil having the highest number (308) of people with disabilities in their workforce. At the end of 2017, the DIA Group renewed the Inserta agreement with the Fundación ONCE in Spain. This project was started in 2012, and has led to 90 people with disabilities being employed by the DIA Group in Spain. The company has now committed to hiring another 150 people with disabilities over the next four years. 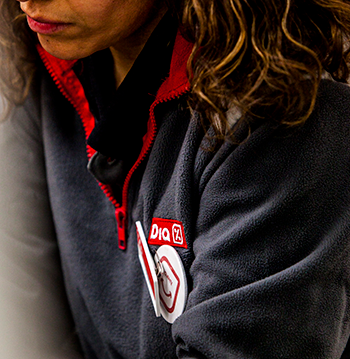 The DIA Group will continue to rely on Inserta Empleo, the training and employment entity of the Fundación ONCE, to cover new positions that the company needs to fill, pre-select candidates that fit the required profiles, and provide personalised training that allows them to carry out the tasks assigned. The agreement also aims to promote other actions that indirectly favour the integration into the workplace of people with disabilities, through the acquisition of goods and services from the special employment centres. Along the same lines, and for the sixth consecutive year, in Spain the company celebrated the International Day of Persons with Disabilities, contributing to the dissemination and awareness of integrating people with different capacities into our company.